Department of State Security Service today paraded a 4 man Child Trafficking Syndicate led by a missionary pastor. The syndicate were arrested and 36 children (12 boys, 24 girls) who were taken from different parts of the country were discovered to have been in their possession illegally. These children were allegedly taken from their parents under the pretense of providing them with better life and education, but were subsequently turned into domestic workers by the syndicate. 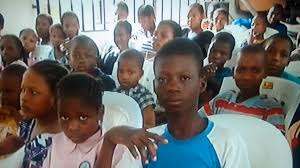 The DSS network were able to trace these children to homes in various parts of the country including Port Harcourt, Enugu-Agidi, Edo and even Lagos. The leader of the syndicate who claims to be a missionary pastor denied using the children as domestic workers; he said he collects the children from their parents and hands them over to people who have "christian hearts" and will send them to school. The only female amongst the group, Tonbra Alazigha, claimed she ran a charity organization and cater for the needs of children and allegedly sends them to school; her claim however was refuted by one of the rescued children who said she worked at a farm in Bayelsa. According to the little girl, Tonbra had told her guardian that she would be admitted into school but she has rather been used for farm work and hawking of water, without the knowledge of her people. Her story was confirmed by one of the rescued boys. The 36 children are now in the custody of the Bayelsa state DSS and will be handed over to officials of NAPTIP for further investigations.